Rod Ostoski has joined our SCPCUG Member Home Pages (http://www.scpcug.com/memhome.html). Rod's site is actually called Ardynas Kennels Home Site and you can visit it at http://www.ardynas.com. Guess you could say Rod is going to the dogs (just kidding). Seriously, although Rod works in Information Management for the United Space Alliance, his family is in the dog business. As Web Master, I try to keep the SCPCUG from giving the appearance of indorsing any particular business, but in Rod's case his site is more about his family and their love of dogs rather than trying to sell us anything. Besides, those pictures of the dogs are hard to resist for dog lovers. Aside from that, Rod has done a unique and remarkable design job on this site. He said this is a kind of a prototype for some of the sites he is working on at United Space Alliance. Rod calls it a TV site because there is a border around the entire page which remains in place while other pages scroll in the middle. It is basically a seamless frame site, i.e. a frame site that doesn't look like a frame site. Rod used Photoshop to design the frame, then sliced it up as you would a large image. Each piece of the frame gets it's own page that loads with the site organized by the frameset index.html. If you watch carefully you can see each slice added to the frame as the page loads. Rod says, "Navigation is at it's best on this kind of site". I would certainly agree with that. In last month's column I briefly mentioned a VideoMail program by Chillisoft, a company located in Australia. Their web address is http://www.chillisoft.com.au/. Don't make the mistake I did. We get so used to hearing and seeing ads for everything ending in "dot com" (.com) that when I told a few friends about the program and they asked where to get it I just said "Chillisoft.com". Unfortunately if you do that you will end up with another company named "Chillisoft" selling software but located in the USA. The "au" at the end of the web address for the company I'm referring to stands for Australia. Why all this explanation? Because this month I plan to review the program Chillisoft VideoMail ver 2.02. Now, before you dismiss this article saying "I don't have any video input device on my computer so I can't use the program", be advised you don't need a video input device i.e. video capture card, parallel port or USB (Universal Serial Bus) video camera. This program works great for sending "audio only" (VoiceMail) messages. All you need is a microphone and sound card. Almost every consumer multimedia computer sold today comes with these. 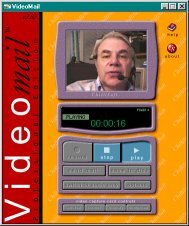 I have another VideoMail program made by Smith Micro called VideoLink Mail (http://www.smithmicro.com/products/prodvm2.htm). Version 1.0 originally came bundled with the Avermedia Video Capture card (http://www.aver.com/products/avertvphone.html) I purchased two years ago. I like VideoLink Mail and have used it extensively but was intrigued by one thing the Chillisoft VideoMail program did differently. The SmithMicro program saved the resulting file to either their proprietary format with the extension ".smv" or as an executable (.exe). The ".smv" required the party you were sending the message to, to have a copy of SmithMicro's player software installed. The player software is a free download but an inconvenience for someone you do not regularly correspond with. For those people, sending the file as an ".exe" is the way to go. Until now, the only drawback was the file size was somewhat larger because the player is included within the message. However now, and understandably so, with the arise of the Worm.ExploreZip virus (read about it on CNET at http://www.cnet.com/Content/Reports/Special/Virus/) many people are very reluctant to open any e-mail attachment containing a file ending in ".exe". Enter the Chillisoft VideoMail program. It saves your message files in the Real Networks (http://www.real.com/products/player/index.html) RealMedia format (.rm). To play these messages all that is required is RealPlayer 5.0 or the latest version, RealPlayer G2. As I mentioned last month, RealPlayer is a "must have" program for anyone serious about surfing the Internet. It's impossible to take advantage of all the Internet has to offer without the RealPlayer. There are just too many sites that use this format. So now on to my review! (As you can tell I have been "wandering" again, hence the name of this column.) The Chillisoft VideoMail ver 2.02 program is available as a free 15 day trial. It is a large 7.78MB download. On installation you are given a choice of compact, typical, or custom. Choose custom. This allows you to see everything the program will install. If you already have the RealPlayer 5.0 or G2 installed on your computer, you do not need to install another RealPlayer so uncheck the RealPlayer 5.0 box. If you don't have a video input and are therefore going to use the program for "audio only" messages then uncheck the Animated Overlays box which applies only to video. This will eliminate 5179KB from the installation process. The installation itself went very smoothly with no glitches. There is a Configuration Wizard that walks you through the setup the first time you start the program after installation. If you have a video capture card, it is automatically detected and the program then defaults for recording a VideoMail message. You can click the "switch to audio only" button if in video mode to record just a voice message. This is especially helpful for those "bad hair" days. An audio message is first recorded in Windows wav file format. This is similar to using the Sound Recorder in Windows 95/98. After you record your message you can play it back in preview mode by pressing "play" and if happy, press "save to disk" or send it directly off as an e-mail by selecting "send mail". I prefer to save it to disk first and then make the saved file an e-mail attachment. In either case your temporary wav file was converted to the rm format that RealPlayer uses. This is the spot where Chillisoft VideoMail really shines. Anyone familiar with the wav file format knows these files can get quite large quickly. With the Chillisoft program I was able to send a 4 min and 39 sec voice message as an e-mail attachment to an old college buddy Bill Riha with no problem at all. The VideoMail program compressed the 4332KB wav file down to 177KB. In the video mode the program is just slightly more complicated. Your message is initially recorded in Windows avi format and then converted to the rm format when saved. Again you can preview you recorded video message before saving it. There is also a edit mode where you can cut off part of the front and/or back ends to trim down your final file size. Before you finally save your video message you are offered the option of using a video overlay. Chillisoft offers a variety of video overlays for various themes (Hearts, Daises, Port Hole, Strange Flower) and occasions (Christmas, Birthday, Congratulations). Some are animated and some are not. The guy in that hat behind this "Strange Flower" overlay is SCPCUG member Robin Mills. As mentioned earlier the overlays actually took up a large part of the download (approximately 5MB). They are okay but in my opinion not one of those unique features one really must have. One problem with using the video overlays is you cannot preview the overlay in advance with you in the picture in order to know where to position yourself. You have to either guess at it or do several trial and error recordings. The overlays actually add very little overhead to the file size of your video message so don't be afraid to use them if the mood strikes. One problem I had, which I do not believe is the fault of the Chilisoft VideoMail program, is that my video capture card kept wanting to default to a video driver codec it uses with the SmithMicro VideoLink Mail program. Each time I started the Chillisoft program I would have to select the "compress" button under "video capture card controls" and change the setting to "full frames uncompressed". Chillisoft warns you that using various compression codecs as your video file input may not work as the Chillisoft program is compressing the data into the RealPlayer format. In effect you would be trying to compress the data twice. Some of you are now probably saying, "What the heck is a codec"? Codec is short for compressor/decompressor. Codecs are used to squeeze large size data files down to reasonable sizes. Popular codecs for video include MPEG, Indeo and Cinepak. Your computer already has a number of codecs installed for both audio and video by Windows 95/98 and various multimedia programs. On your computer go to Start button | Settings | Control Panel | Multimedia | Advanced. In the resulting window listing of Multimedia devices you will see "Video Compression Codecs" and "Audio Compression Codecs" with plus signs in front of each. Click on each plus sign to see the variety of codecs you already have installed. Back to the Chillisoft VideoMail program. I have already mentioned the great compression for audio messages. It is even more impressive for video. The program allows you to choose among 10 different compression settings depending on how you want to balance quality versus file size. I recorded a sample 23 sec video message (160 x 120 pixels, 24 bit RGB) using maximum compression. The resulting original avi file size was 12.5MB. The Chillisoft program compressed it down to a 53KB rm file. I again resaved the 12.5MB avi file but with the "Strange Flower" video overlay. The resulting rm file this time was 60KB, only 7KB more. I have mentioned this VideoMail program within the context of sending audio and video e-mail messages. But there is another possibility for those of you that have created home pages on the web. You could record a short audio or video message, save it in the RealMedia format and post it on your home page. What a great way to introduce yourself and say a little about what your website has to offer those surfing on in. The downside to this is your Internet Service Provider (ISP) must have the server upon which your home page is stored configured to recognize the RealMedia format. If it is not, a person clicking the link on your web page will find the file downloading within his browser as ascii text. Either check with your ISP or try a test file to see if your ISP's server is configured to recognize RealMedia files. Our ISP, Palmnet (http://www.palmnet.net/), recognizes the RealMedia format for it's Users Personal Home Pages (http://www.palmnet.net/users_pages.html). There is away around this configuration problem if your ISP's server does not recognize the RealMedia format. If you can post your RealMedia file on a FTP (File Transfer Protocol) site, it can then be called via FTP by the link on your web page. Unfortunately most people do not have access to server space on a FTP site. Understand that the RealMedia file you post on your website will not come down as streaming audio or video. But if the file is small (say under 60KB) the download time should be less than 30 sec. This is similar to downloading some of the larger midi files. I think most people would find that an acceptable wait time to hear what you have to say. Finally, as I write this, Chilisoft is near releasing version 2.03 which they say fixes a few minor bugs and offers some enhancements. I am not aware of any significant changes that would contradict what I have stated above.